At Cool Ribbons we can print messages, symbols and logos on a range of coloured ribbon in varing sizes. 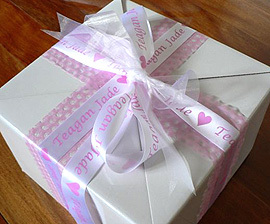 A gift wrapped with a printed personalised ribbon is a momentous personal touch. A printed personalised ribbon adds that extra special decoration and a creative finish that will leave a lasting impression. so no matter what the ocassion, we can create the perfect personalised ribbon message. And there is no limit to the uses.